Before practicing Bikram Yoga, I had been a long distance bicyclist and competitive tennis player but had to give up both sports due to advanced osteo-arthritis. I also had my larynx removed due to throat cancer and had gained a lot of weight due to inactivity and an inactive thyroid due to the throat surgery. I had a stressful job at the City of Scottsdale and at the time was working on my masters in "Good and Sustainable Communities". Two days before my retirement I met a co-worker coming out of CVS Pharmacy. She asked me what I planned to due during retirement. 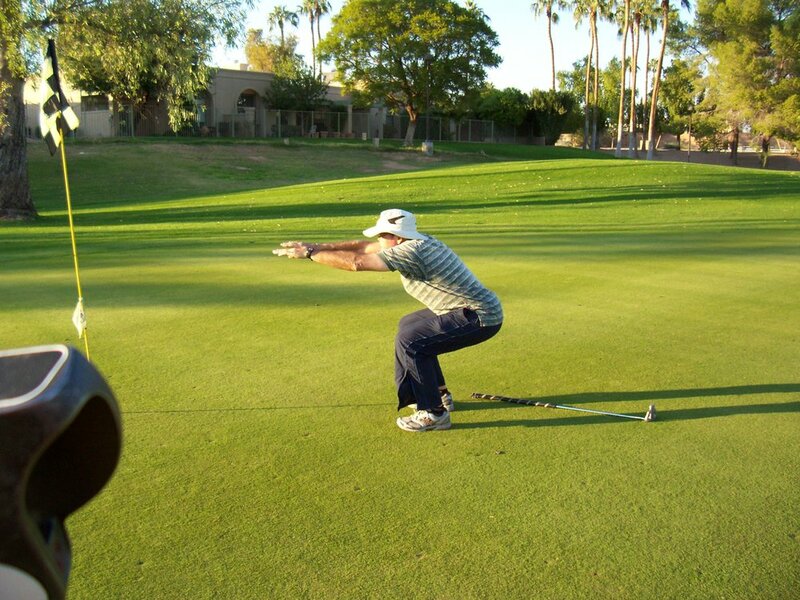 I said maybe some golf and that I had always wanted to try yoga. She then spent over a half hour talking about Bikram Yoga and its benefits. She got me hook, line and sinker and I was in my first class six days later. My first class was December 19th, 2003. I had always enjoyed work outs and she convinced me of the physical nature of BY and how much it would improve lack of flexibility. My masters studies were moving me in the direction of meditation and mindfulness and she emphasized the mental aspect of BY practice. On top of that, I always like the summer heat, so BY is perfect! I have been practicing for nearly 9 and a half years now! I have lost between 20 and 25 pounds. This particularly began after my first 30-day challenge. I ended up needing a hip replacement 7 years ago and after my surgeon reviewed my knee X-rays, he said they were ready for replacement and he would do them any time I asked. When I told him I could still walk 18 holes of golf, he said based on my x-rays, impossible. I believe that is due to Bikram Yoga. My physical therapist compared the flexibility of my knees over a 3-year period and she was amazed that my flexion increased by 12 degrees and extension by 7 degrees. I not only have arthritis in my knees, but also in my shoulders and one of my ankles. In the past few years the shoulders and ankles flared up and my response was to take even more classes, because just standing in the hot room always makes things feel better. In addition my thyroid medication has been reduced since I started BY. I had another bout of cancer about 5 years ago and I believe my BY practice helped me get through the radiation and chemo therapy. In addition, being a laryngectomy means that I breathe through a hole in my neck, called a stoma. Laryngectomies no longer breathe through their nose which naturally keeps the trachea moist and prevents mucous drying up, which can block the airway. Spending 90 minutes in a BY room at 104 degrees and 46% humidity, at the very least helps keep the trachea moisturized. My practice has led me on a journey that includes daily meditation and increased mindfulness. I am less bothered by the ups and downs of life and try to enjoy each and every moment. Some suggestions to new students are: make sure you are hydrated before, during and after (I've seen too many blooming practices halted due to lack of hydration). Come more than once a week, try at least 2-3 times a week. There is too much information to absorb and if you come once a week or less, it's like starting over every time. We humans thrive on improvement and improvement comes with practice, but at the same time, don't judge but observe. There is fine line between the two, but when we observe, we become what we attend to. For my fellow males and people with physical disabilities, focus on form over depth. Good form produces depth over time. Learn the postures step by step. One last thing I have to mention is our yoga family. Folks who practice yoga have a special attitude. Egos are pushed aside and compassion is spread throughout the room. Namaste to all my fellow yogis!